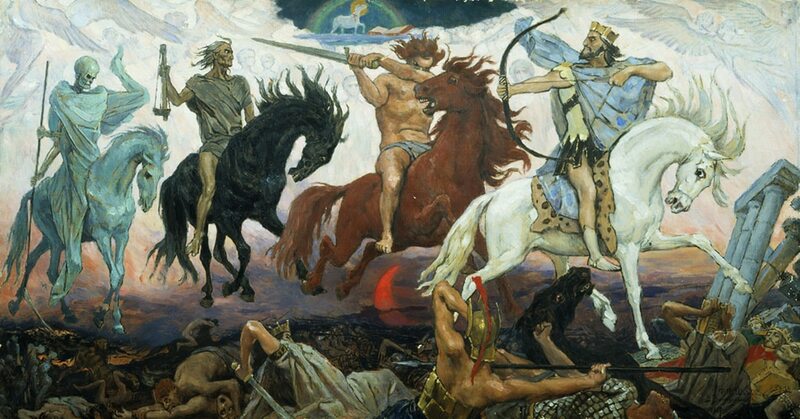 The Four Horsemen of the Apocalypse are demon riders Satan sends out at the beginning of the end time week to prepare the earth for the revelation of the Man of lawlessness Son of Perdition (2 Th. 2:3-4, 8-12). Satan’s disinformation campaign tried to hide their demonic identity because he sent them to prepare the way for the NWO of the Beast, Dragon and False Prophet. Via corrupt copies Satan made it appear the four “living creatures” command these riders “Come” when in fact they are commanding John: “come and see [through my view screen] (Rev. 6:1, 3, 5, 7 TR) . The Greek gives no indication from whence these riders come. They appear out of nowhere as John is looking on. The identity of the four horsemen of the apocalypse is manifest by their fruits (Mt. 7:18-20), they teach falsehood, cause war famine and pestilence. 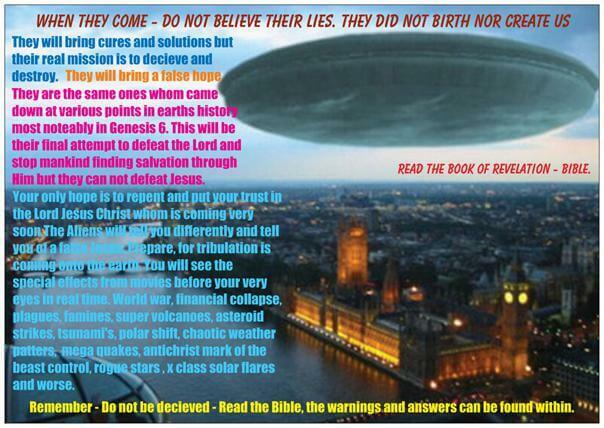 Those evils occur in the same order Christ said: First Seal False Christ (Rev. 6:2; Mt. 24:4-5); Second Seal War (Rev. 6:3-4; Mt. 24:6-8); Third Seal Famine (Rev. 6:5-6); Fourth Seal (Rev. 6:7-8); Fifth Seal Martyrs (Rev. 6:9-11; Mt. 24:9-10); Sixth Seal Earthquake (Rev. 6:12-17; Mt. 24:15-20). Therefore, Christ revealed the identity of the rider on the white horse, its someone claiming “I am the Christ”. Just as the Antichrist is not from God, neither is the demon rider symbolizing him. Other scriptures are pertinent to the claim of being “the Christ”. 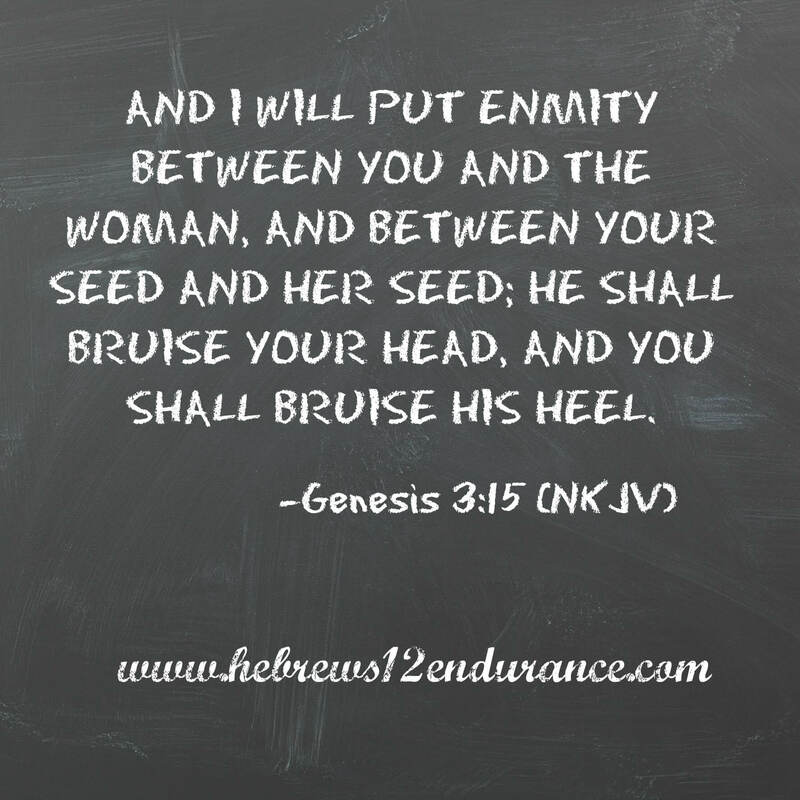 He “opposeth and exalteth himself above all called God” (2 Th. 2:4) yet demonstrates by supernatural signs and wonders “he is God”. These are “contrary statements” if arranged incorrectly. They harmonize if what he opposes is the historic definition of God, every religious teaching about God and claims to be above them all. That fits other scriptures describing “the Christ” who appears at the same time as Satan and his fallen angels appear (Nephilim) disguised as mankind’s extraterrestrial “creators” who also created the hybrid superhuman “Son of Perdition” now declaring himself “elohim” above YHWH the Father and YHWH the Eternal Son (Dan. 11:36-39; 1 Jn. 2:22). His DNA altered either by men under Satan’s direction or the fallen angels themselves, hence he ascended from the abyss (Rev. 11:7 comp. Rev. 9:1-3). The “Designers” claim peace and security has arrived and through their representative the “man of sin” that the fallen away Church received as “the Christ”. It is claimed the New World Order (NWO) will be a place where disease and death need not occur. We will ascend to a higher level, be like god, immortal. Under their prompting a New World Government run by a ten king confederation with “Chancellor Adonikam” is born, a “Grecian/leopard” form of the ancient Roman Empire rises from the sea of humanity (Rev. 13:1). At first, this is benign everything is going well. But then Satan sends in the other demon riders of the apocalypse, to create havoc and terror. He does that secretly, so mankind doesn’t know he is behind the calamities afflicting the earth. They are ready to try anything, the NWO by the same “aliens” who rebuilt the ancient city of Babylon with their wondrous technology seems like a good bet (Rev. 13:2-4). All the world’s religions have a say in the governance of the great city, promoting unity and peace to all mankind regardless the name of the deity called upon. They are in globalist ecstasy and accordingly worship the Beast and the Dragon who gave him such authority (Rev. 13:4). However, an Egyptian led Coalition of nations reject the rise of the Assyrian Adonikam and so are put down (Dan. 11:40). Their opposition to the Man of Sin gone he morphs declaring himself God around midweek. He commands all sacrifices to other Gods cease (Dan. 9:27). Chancellor Adonikam morphed from Christ on a white horse, to the Antichrist Son of Destruction Big Mouth Emperor of the Roman Empire Beast (Rev. 13:5; Dan. 7:8; 8:9-12; 12:7). The angel tells Daniel these particular things are finished by then, when the political power of the holy people is crushed at midweek and they must flee Babylon. But the end is not yet, its just the beginning of sorrows. The ride of the four men of the apocalypse did not go well for Christendom. The Trumpets reveal what happened to the fallen away apostate Church and it wasn’t good. The entire lot of them are slain by the demon cavalry of an angry Dragon, regardless whether they converted to worship him or not. The third of the earth that once called itself Christian is slain (Rev. 9:13-19) die horrible deaths, but the demon cavalry have no power to harm those faithful to God (Rev. 9:4; 1 Jn. 4:4). So hated are Christians by the entire world, they won’t be forgiven their past claim of love for “Creator YHWH” now thought to be an extraterrestrial “Designer creator” like the Dragon and his Nephilim. But that is discussed in The Powerful Delusion.